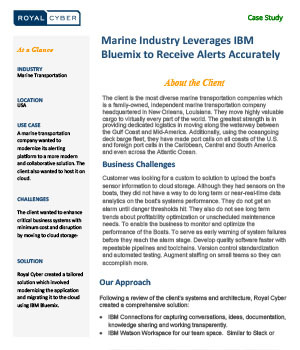 A marine transportation company wanted to modernize its alerting platform to a more modern and collaborative solution. The client also wanted to host it on cloud. The client wanted to enhance critical business systems with minimum cost and disruption by moving to cloud storage. Royal Cyber created a tailored solution which involved modernizing the application and migrating it to the cloud using IBM Bluemix.